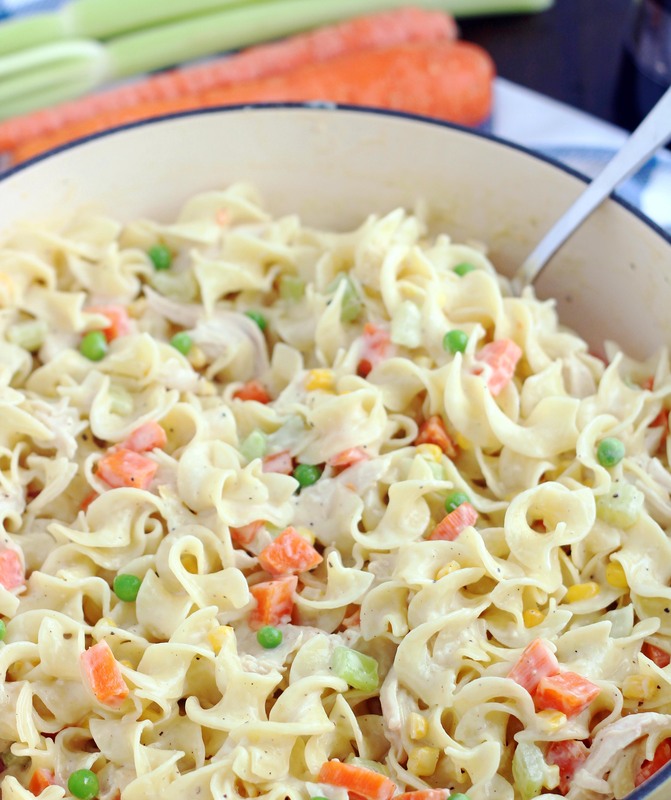 This Chicken Pot Pie Noodle Skillet are a delicious and quick version of the comforting, classic chicken pot pie. Incredibly simple to make and so, so good. These will definitely become a favorite. I’ve rambled on many, many times before about how much I love skillet meals, so forgive me while I ramble on a little more. This Chicken Pot Pie Noodle Skillet reminded me again how much I love skillet dinners. They’re lifesavers on so many nights and seem to be the perfect thing to quickly throw together when life is crazy and busy. Heck, even when your day hasn’t been crazy, but you just didn’t get your act together that day and desperately need a idea for dinner. 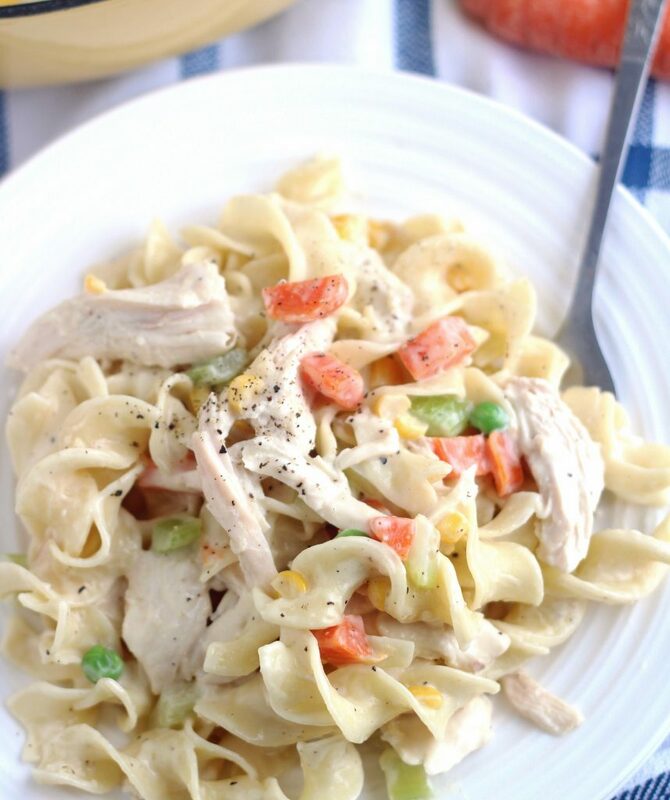 . . skillet meals to the rescue. 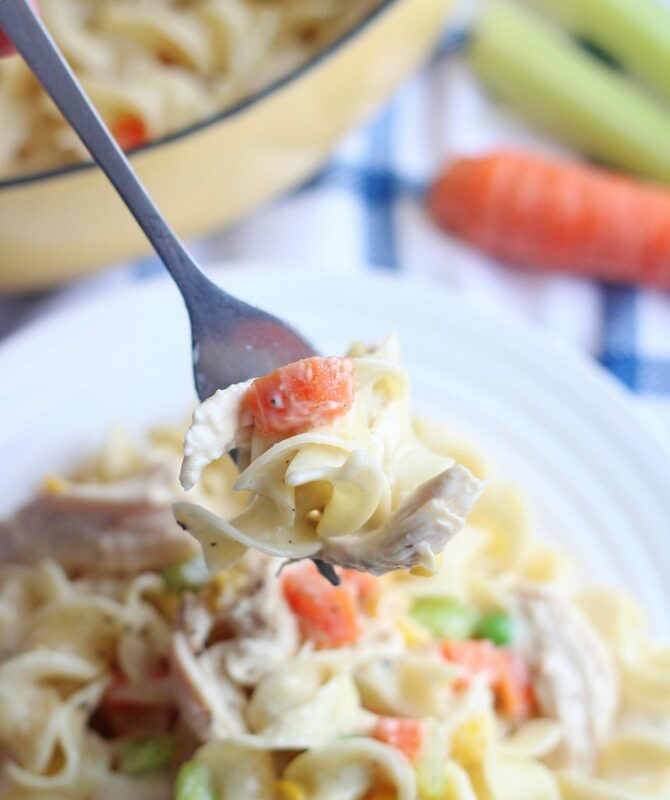 This meat & cheese pasta, this skillet chicken spaghetti and this Turkey Taco Quinoa are just a few of my favorites, but this Chicken Pot Pie Noodle Skillet became a favorite in about 10 nanoseconds the first time I made it. It’s total comfort food and so incredibly simple to make. It comes together in about 20 minutes and using a rotisserie chicken makes it even easier. If you cook your own chicken you cane even cook and shred it earlier in the day, then it’s ready to go when you’re ready to get dinner started. For the record, I 100% do not care for cooked peas (actually, I think they’re nasty! ), but threw a few in for pictures (lol!). So feel free to leave them out if you have an aversion to cooked peas. Serve this with some crusty bread and a toss salad and you’ve got a fantastic dinner! You’ll be making this over and over, I promise. In a large skillet over medium heat, melt butter. Add carrots, celery, onion, and garlic and season with salt and pepper. Cook until softened, 3 minutes, then stir in flour and cook 1 minute. Stir in chicken broth and heavy cream and bring to a boil, then reduce heat and simmer, stirring occasionally, until thickened, about 5 minutes.